The Vegas outpost of Fleur de Lys is no more. 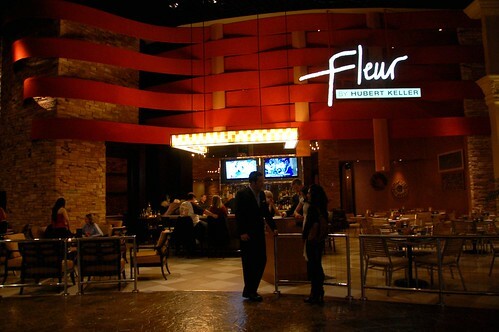 Fleur by Hubert Keller has replaced it. More casual. More variety. Less expensive. The only thing I miss is the gorgeous fresh rose wall decoration. This new iteration is much more conducive to affordable group dining. Fleur served as our pre-theater meal before we saw The Lion King. 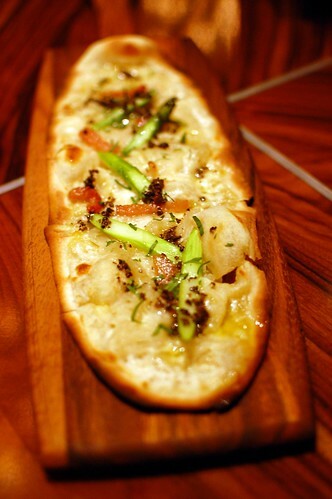 A special of the day -- tarte flambe ($11). Light and steeped with fresh asparagus. Strong start. 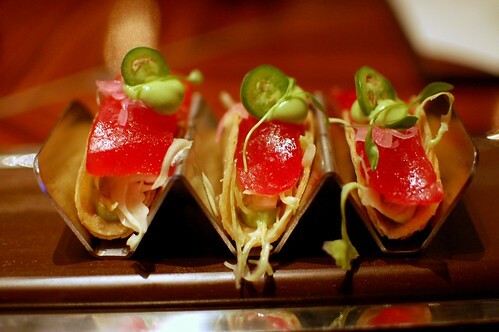 Tuna tacos, serrano, cilantro, avocado cream ($11). So simple yet so cool and cute. Nice nibbles. "In the shower" mac 'n' cheese, lobster, brunoise vegetable ($14). Any Top Chef Masters fan will recall Chef Keller's impressive dorm challenge win for making pasta in the shower. 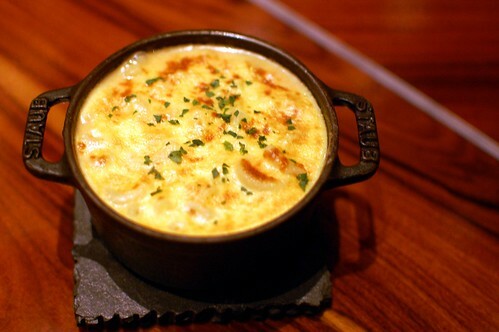 If that dish was anything like this creamy crock of goodness, he deserved that win. Magnificent mac. 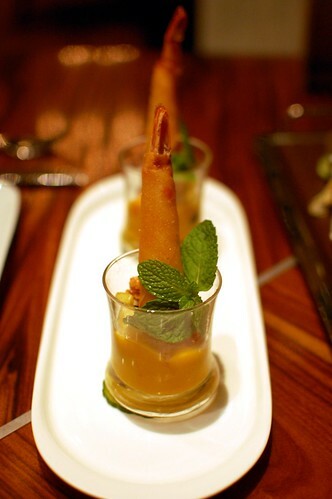 Brick dough-wrapped prawns, tropical fruit, curry ($17). Nice crunch but rather pedestrian, especially for the price. Skip. 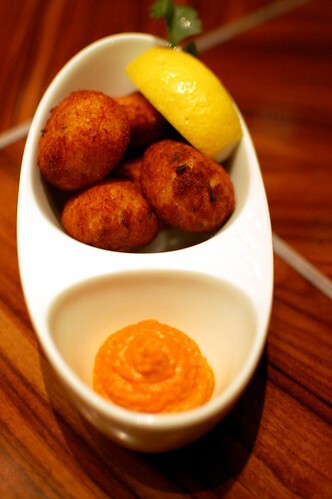 Salt cod fritters, jamon Serrano, romesco ($8). The fritters need more salt, and the romesco was surprisingly bland. Skip. Maple-glazed pork rib smoked to order ($12). This dish was presented under a smoke-filled glass. 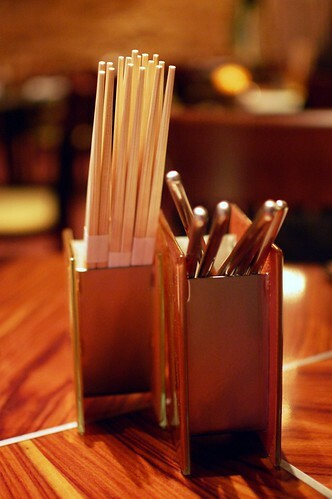 When our server lifted the cover, it all billowed out and showered us with the smell of char. Tasty enough. Worth ordering just for the show. 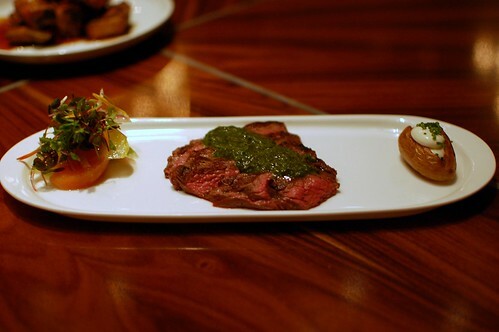 Skirt steak, chimichurri, roasted fingerling, crème fraiche ($15). Damn good piece of meat and the cutest tiny potato ever. Solid but not earth-shattering. A special of the day -- modified Peking duck with date sauce ($13). Asian fusion or Western takes on Asian food usually disappoint me. I didn't object quickly enough when Mr. Monkey ordered this special. Lucky for both of us, it was one of the best things we ate during the meal. 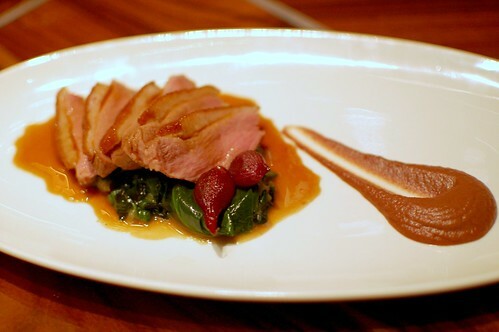 The duck was so tender and flavorful, and the date sauce was incredible notwithstanding its baby poo-like appearance. 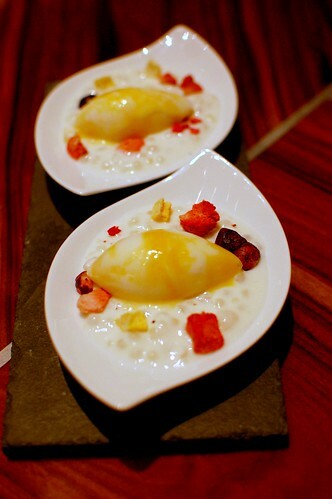 Coconut soup, tapioca, coconut-passion fruit sorbet, freeze-dried fruit ($7). Another successful order by Mr. Monkey. 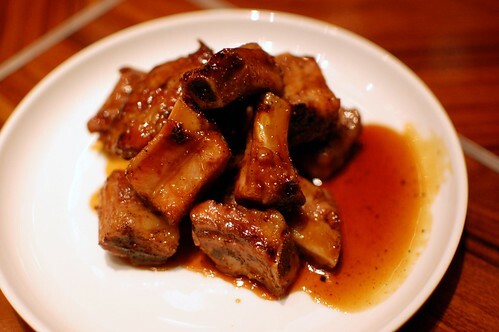 Really beautiful in appearance and taste. I don't even like coconut, and I loved it. Tapioca lovers must try this! 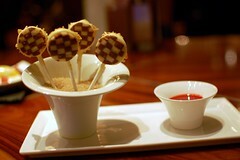 Cheesecake lollipops -- white chocolate, kumquat-gingerbread, strawberry coulis ($7). 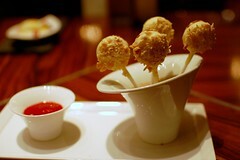 If you couldn't tell, I was enamored with these adorable lollipops. They looked better than they actually tasted, but I was still very happy with them. Two-sided! Checkerboard! 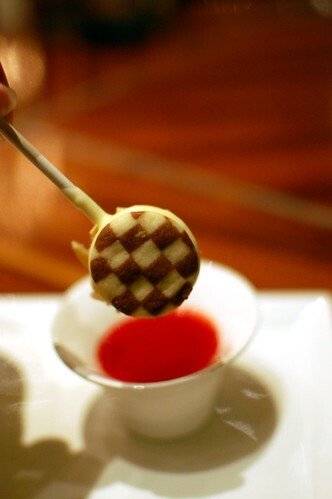 Dipping sauce! Fun! This dinner was comped, as were our tickets to The Lion King. Hakuna matata! I love a food show! Hakuna matata indeed. OMG, yum. and those lollipops? so cute! 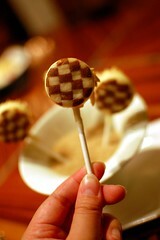 The lollipops were really cute! And the prices looked reasonable! wait, you watched a musical? well, the bear hates musicals and shows, but he actually like lion king when it was at the ahmanson. that coconut soup looks so good and exactly like my cup of tea. mmm. This place looks fabulous! Especially the mac and cheese. Looks like a good change for them. We haven't eaten at Mandalay in years, so we're totally out of the restaurant loop over there. 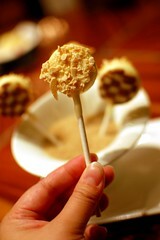 The cheesecake lollipops look so great! Love the "in the shower" dish title.